Recently, there's been an awful lot of Riley riddles across PSE. Why are they so prolific? I think there's three main reasons: they're quick to write, quick to solve, and apart from its minor gimmick they're very accessible. This crossword's also like a Riley riddle! Firstly, one-third of the clues are quick to write: turns out writing clues is quicker when you leave out one letter from each of them. The dropped letters will spell out my thoughts on some of the Riley riddles in PSE. Another one-third of the clues give answers that are quick to solve: when entering them into the grid, you can skip writing one entire section of them! In the spirit of Riley riddles, each of these entries is missing either its prefix, its suffix, or its infix, leaving behind a word (of varying degress of commonness). Looking at the missing parts should give you an idea of my attitude towards Riley riddles. Apart from the minor gimmicks, the last one-third of the clues are more accessible: they're read and entered as directed. This is my first big variety cryptic! Let me know how I did! 5a (track), 11a (short), 15a (career), 19a (lying), 24a (evens), 31a (severe), 32a (please), 3d (dallied), 4d (ends), 8d (manage), 14d (flight), 22a (vain). This appears to spell THEYNEEDSAFI so it seems like something has gone wrong at the end. [EDITED to add:] Aha! ManyPinkHats suggests in TSL chat that 4d is not meant to be missing a letter (though I do think the clue works much better with "ends" than with "end") and that 23d should have "flexes", so we get THEY NEED A FIX. I bet this is right. 1a (CONSIDER), 16a (DISMISSAL), 17a (PATENT), 22a (DISPLAYS), 25a (INTERMITTENT), 30a (MALINTENT), 1d (REMITTENT), 2d (SUBCONTRACT), 5d (DISSENT), 7d (DISINFECT), 21d (INCONSTANT), 27d (LACONIC). It would appear that Level 51 is DISCONTENT about all the Rileys. This was a lot of fun. There are a few clues I don't wholly understand and a few elements I'm not in love with, but on the whole I thought it was very good indeed. 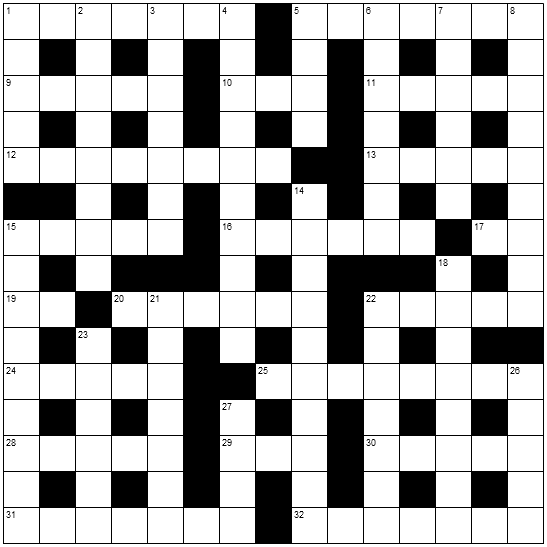 Here's a list of quibbles; I must reiterate that I thought this was a really good puzzle and plenty of newspaper-published crosswords would get similar lists from me. 11a: not wild about "condition" cluing "iff"; seems a bit loose (and also maybe a bit niche-y, though this place is crawling with mathematicians so maybe that's OK). 12a: presumably "drug" clues TAR meaning black tar heroin? I'm not sure it's correct to call that just "tar". Then again, pretty much every short noun has been used to mean some drug or other, so it's probably fine :-). 24a: this is the one and only place where there needs to be an actual change in the clue to accommodate the dropped letter (evens -> Eve's, with a capital letter and an apostrophe). That's not wrong but it feels a bit odd: I'd rather either embrace the idea that clues might get substantially changed about and make sure that several do, or else find a way to make none of them change at all. 29a: a bit of a shame that "part of" turns out to mean "initial part of". 4d: I think this does really need "ends" rather than "end", though of course that spoils the surface. 5d: I confess I don't understand the wordplay for this. (Maybe "Mark's clothing" is NT -- the gospel of Mark! -- but I don't see how "sloppy" would clue DISSE or CONSE.) 15d: I don't really like "out" as a prefix rather than suffix anagrind. 21d: I suspect a lot of Orthodox Christians would get cross about "idol" cluing ICON, though I suppose it works OK if they're both taken metaphorically. Not the answer you're looking for? Browse other questions tagged wordplay cryptic-crosswords or ask your own question.